Thank you so much. I love your style & post so your response is a big compliment. From one NYC girl to another…. much appreciated. You look stunning I adore this outfit, the bag is such an eye catcher and love this layering look, very chic! LOVE it! I love all black outfits, and you gave yours a very classy look. That bag definitely tops it off right! Those shoes are swoon-worthy. Wow, super flattering. Thank you very much. I’ve had the bag for some time now. I don’t use it as much as I just to but it’s a keeper. Btw, the skirt is a jet wine. The darkest wine color you can get. Unfortunately the color doesn’t read well on camera. Ohh wow I kind of wish I could see the outfit in person then, I’m a sucker for dark burgundy with black tones 🙂 I plan to have more fun with that shade with the colder months soon upon us (well, I’m at least praying for it here in CA haha). Oh, I’m sure you’ll be able to take advantage of the color…… maybe not in leather or wool. Thank you so much. The minute I saw those shoes online, I had to hve them. I actually took them a step further & added the spikes that go down the center. All the round head studs came on there. Love this chic look and those shoes are to die for! Your look is so sophisticated..im loving it. Thank you so much. I hope you come back and visit next Monday. I’ll giving everyone a look that’s a completely different side of me. 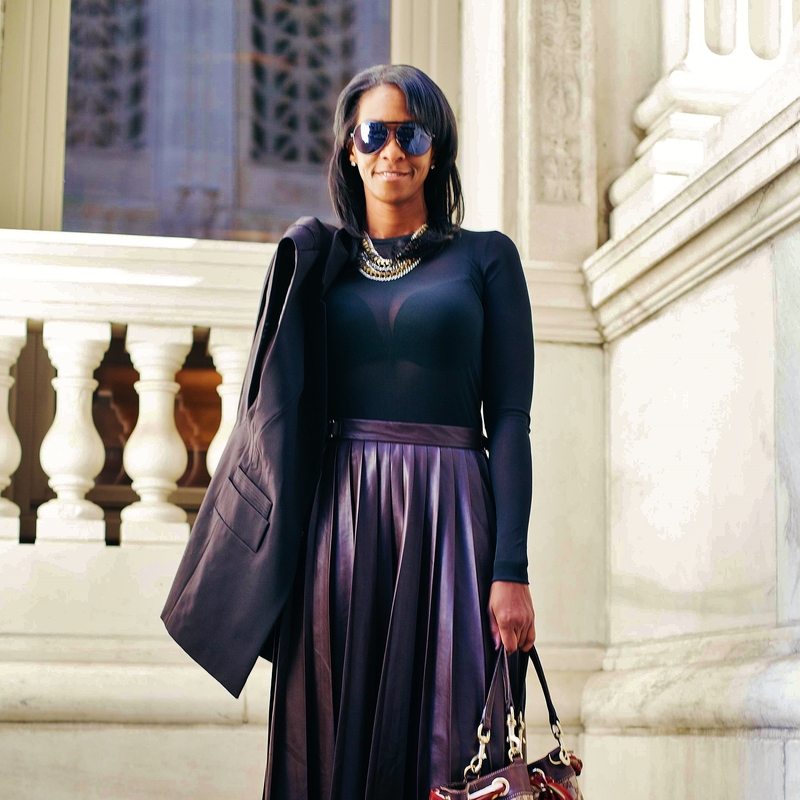 Love this… beautiful monochromatic ensemble; great styling doll! You look so chic, I am in love with this entire outfit ! Your shoes are beyond ! Ohmy, your heels are absolutely killer! big love! This look is draw dropping, you look AH-MAZ-ING! Oh my, thank you woman. Looove the vest! They’re so versatile… great for any occasion. Great outfit lady! Thank you very much. Love your post from yesterday. That A&O sequin dress is a must have. Your handbag and shoes are amazing! Love your outfit! Thank you. Both of these pieces seem to be a hit with the masses. 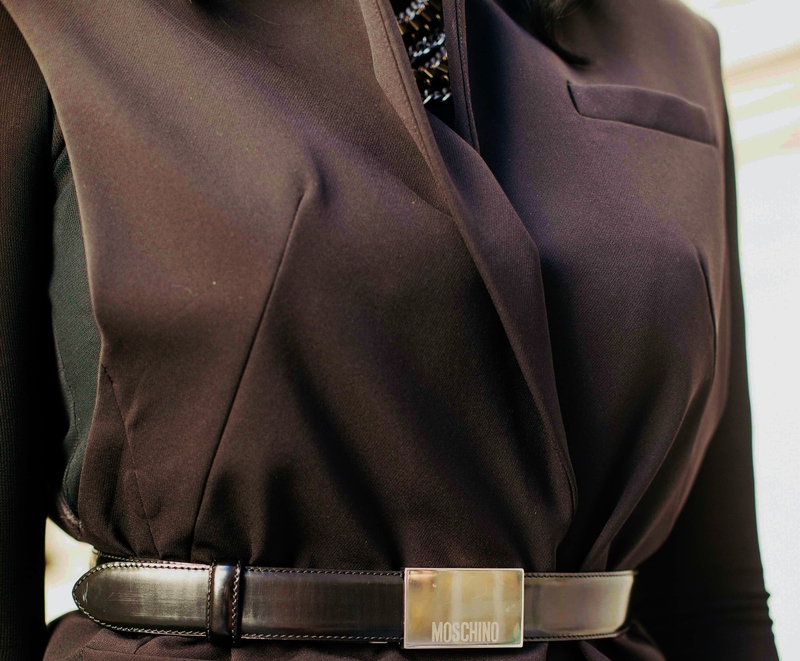 I am loving the LBV trend this fall! Black faux fur vests are by far my favorite of the spins. So chic, love the all black! Love your shoes & blazers! Very elegant and chic combination! I adore the skirt so much! Thank you. I enjoyed your last post as well. The right camera is key. amazing! you are soooo chic!!! This outfit is so cool! I have a leather vest that I wear alll the time. Yours is so cute though and I love those heels! thanks for visiting my blog! i followed you on Bloglovin so I can read more of yours! Staying warm AND looking chic. Love it!